Let me go ahead and spell it out for you. I did not like today. It was hard, tiring, frustrating, and really tested my patience. Makenzie woke up almost two hours early and remained super cranky throughout the entire day. The one day this week I hoped to have time to get things accomplished vanished before my eyes. I was in one of my hormonal induced moods and felt angry and stressed. Good thing Ashley from Nourishing the Soul helped squelch all that. 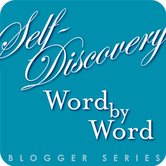 She has started a special Blogger Series called Self Discovery: Word by Word which features a different word and topic each month for anyone around the blogging world to share. Check out the link for details on how to participate! When Ashley contacted me, asking for my participation, I gladly accepted. I originally intended to do a more thorough discussion of the topic and something more profound. Well, I needed a dose of gratitude and perspective today. I just needed a reminder! I usually do a good job keeping things in check on my own, but I’m only human and some days I need a little help. Today I choose to listen to my gut. Instead of a more analytical and inspiring post, I will simply write what I need to remember – all the things which deserve my gratitude. Despite her keeping my hands more full than usual today, I still could not imagine my life without her. She never fails to make me laugh. She gives my life purpose. And I am also so thankful that I have the blessing to stay home with her. I know how truly lucky that makes me. You all know I love fall. Being able to enjoy the outdoors and see scenes like this deserves gratitude. Life is too wonderful to pass it by without taking a second look at our surroundings. While at the park with friends, which I am also thankful for, I even recognized that I have gratitude for nasty public restrooms. I originally took this picture to gripe about “hover worthy” restrooms at parks. How about I appreciate the fact I have such luxuries as running water, plumbing, electricity, etc? After all, without electricity I would not have been able to easily whip up these…. Pumpkin Nutella Oats. I know my Twitter pals loved the idea of this one. Now looking at this picture I don’t simply see a delicious bowl of food for breakfast. I also see food. In abundance. I have easy access to food, which is more than many in the world can say. How thankful I should be for that! I almost didn’t work out this afternoon thanks to stress. Then, I decided I need to show gratitude to my body for all it can do and treat it with respect. I know it longs for activity when I feel this way and I always feel better afterwards. So I did some TurboKick again. Today was no different and I’m so thankful to my body for taking care of me, my baby, and knowing just what to do at all times. Most importantly, I need to show gratitude to God. Without Him, my life would likely still resemble a shattered mirror broken across the floor and trampled over by my own insecurities and doubts. He saved me and continues to save me. He loves me and gives me peace every time I open my heart to Him in prayer. No matter what inappropriate words may have left my mouth moments before. Blessing surrounds us and we need to walk into its sweet embrace every day. Some days prove more difficult than others. Believe me, I know. However, if we take a second look at things and pause to breathe, we often find beauty that leaves us with nothing but gratitude. I started my day overwhelmed with annoyance. I will end it overwhelmed with gratitude. What are YOU thankful for today? Small or large…it all counts! It’s good now! I was able to get a bunch of stuff done tonight…and chill on the couch in comfy clothes. Perfection! In some of my down moments, I try to remember how lucky I am to have my health, family, and someone who loves me/someone to love. Although it doesn’t always work, it kinda puts things into perspective. thank you for reminding me of such important perspectives… I have So Much to be SO Thankful for. It’s been a rough week so I spent my lunch hour at the park with God & my prayer journal and I felt so much JOY afterward! Just what I needed today! (& everyday) I’m thankful for: an amazing husband and wonderful kids who make me laugh every single day and God who gives limitless grace & mercy even tho we don’t deserve it. Hope you have a wonderful evening! Isn’t it amazing how prayer can just uplift you. I actually felt silly when I realized I didn’t turn to it much earlier today. And I KNOW what it can do for me. I love this post! I am so thankful for God saving me….for restoring me….for blessing me beyond measure….for holding me when I am lonely and dont understand….for always teaching me his ways! I just have to trust him and know that he is going to make everything okay through the good and the bad. He has already won the battle! I also had pumpkin oats this morning! it was soooo amazing! Congratulations! I’m so excited to read about your experiences and input! I’m thankful that my husband takes such good care of me when I’m sick. As far as the bathroom goes, you could be thankful that your husband doesn’t leave the toilet looking like that at home. Bahahaha!!! Now THAT is awesome. I’m thankful for my family. They’re so supportive and good to me! i’m thankful for my job…even though i don’t love it i have money and freedom, which is more than a lot of people could say! I’m thankful for a husband who sends me emails at work that make me tear up (in a good way). I love reflecting on everything in my life I have to be thankful for. It is a great way to get perspective on things. That’s something I have learned from reading your blog and the beautiful messages you write! You always have the best posts! You always help me to focus on the positive in my life. I always forget to be thankful for what I have, even the little things, especially my body, which never lets me down! I loved reading this post. It’s great to remember all the things that we can be grateful for. I’m so grateful for my husband. Am so grateful for the job I get to do. So grateful that I’m feeling so much better than just a few months ago. And I’ll have to check our Ashley’s blog – sounds like great timing indeed. Her blog is really great and inspirational too. I love it! Oh boy, you must be sharing some of your pregnancy hormones with me today. By the time I got to the hairdresser, I could barely smile and she could tell right away that conversation was out of the question for awhile. She took me to the sink and gave me such a good head massage that I almost started to sob. Seriously. What’s up with THAT? I would have been mortified. As it was, I kept my eyes closed and just let the tears well up a tiny bit and by the time she finished, I was feeling a little better. Never underestimate the kindness of a good hairdresser. Today I am thankful for family. Mine drove all the way from San Diego to Oregon so they could watch me run the Portland Marathon on Sunday. I don’t even have words for how thankful I am for them! That’s so fabulous!!! I bet that support will be amazing come Sunday. And hopefully they can take care of you if you’re still feeling under the weather. Are you doing better? and i love you too, Krys! I am grateful that my father is coming to visit me this weekend. Ohhh lady…just what I needed as I sit here tonight complaining about our messy condo, the early wake up call I’m getting tomorrow and whatever else is running through my head. My legs. They allow me to move quickly! My hubby. He understands, knows and loves me the best. My family. They support me in everything. My home. It provides us with a safe, cozy and warm roof. Food. For I can it whenever I am need. Why did I ever abuse you? I’m thankful for a home that is always warm and comforting when I get back from a long and stressful day. lol @ the toilet picture! RYC: I have no clue how to change my comment settings or i would – thanks for visiting my blog!! Isn’t it amazing that reading someone’s posts about gratitude makes you feel so much gratitude yourself? Your post inspired me today too. Now I am thankful that my best friend is flying to Boston to visit me, and I will be seeing her in a couple of hours! Ok, I think I’m way too snarky to be over here. But I’m love me some MizFit and saw your comment and tip-tap-typed over. I totally believe that it’s our obligation of grattitude to be grateful. Thanks for rocking out with that soup to nuts. Haha! You just stumbled on one of the touchy feely posts which do come up here. I still love me some wit and sarcasm though! Hope you come back. I just checked out your blog. I love your little bio section and can’t wait to read more. Tina, I’m so glad that the series came at a good time for you! It’s amazing how things can happen in our lives right at the moment we most need them. I loved reading about the beautiful things in your life that you are thankful for. I’m certainly thankful for you and how you’ve inspired me over the past few months since I began reading! I am grateful for an absolutely beautiful day, and for my job’s flexibility, which allowed me to leave early and enjoy the weather on my walk with the dog, where I ran into a friend from elementary school who now lives around the corner (1000 miles from our hometown). That’s so cool! How crazy to reconnect like that. I am think for for the life god has given me. It took a long time to get here and I have lost sight of the important things many times. It is truly the little things in life that has given me so much joy lately. I am thankful for crossfit saving me from myself. I am thankful for my friends and family who support me day in and day out. Even in the most stressful times I couldn’t ask for a better life.Through love, and loss, pain and joy I have been shown that life is a precious gift and must be cherished even when everyone would say it is ok to break down and give up. Life is too beautiful to give in. I am thankful for the little blessings god gives me each and every day. I know I don’t say it enough. I love that you took a shot of the bathroom! Clean public restrooms never fail to make me happy! M with her foot out and her hand on her hip? Who says she is a little girl? She is growing up quickly! Toot cute! I absolutely love this post. You are so right that sometimes we need to step back from trying to say something profound, and just revel in the simple reminder. Thank you for participating in this series! And thank you for linking to my post, I really appreciate it! I am thankful for so many things: Jason, my family, my strong body, my warm house!, a nice bed, a warm house, food in the fridge, money in the bank, a decent job, and so much more. God has truly blessed me and I am very grateful! I’m thankful for my amazing father who helped me set up my new media stand. I love how it looks but Traget furniture directions are confusing! I am thankful for so many things! My husband every day. But today especially, I am thankful for simply having a job. I went to a Leadership Conference last Friday and the Keynote Speaker was Mary Kay Mueller, a/k/a the Gratitude Guru. She talked about many of the same things that have been shared here. I am getting ready to read her book 8 to Great The Powerful Process for Positive Change. If any of you get a chance to hear MK Mueller speak take it … she is really inspirational. I think there is great power in being grateful for the small everyday things, victories and people who share our lives. Thanks for posting this here too. I generally have to skim through comments on others’ blogs so I did miss that. I need to check into her book. I love books that share uplifting messages. This post is so great for moments we find ourselves becoming discouraged. All it takes is a moment of reflection to shed light on all that God has blessed us with. Thanks for helping me refocus this afternoon and truly appreciate the important things.